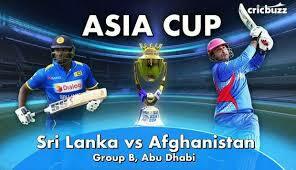 Afghanistan vs Sri Lanka the 3rd match of Asia Cup 2018 being played in Sheikh Zayed Stadium, Abu Dhabi on 17 Sep 2018. Kushal Mendis, Upul Tharanga, Kusel Perera, Angelo Mathews, Dhananjay de Silva, Thisara Perera, Dasun Sanaka, Shehan Jaysuriya or Amila Aponso, Dilruwan Perera, Suranga Lakmal, Lasith Malinga or Dushmantha Chameera. This is the first match for Afghanistan while 2nd match for Sri Lanka in Asia Cup 2018. Sri Lanka has had lost his 1st match against Bangladesh which was the opening match of Asia Cup 2018, Ban vs SL. So it is most necessary for Sri Lanka to win this match to stay in this tournament. Srila Lanka team looks stronger as compared to Afghanistan but after looking at the previous performance of both the teams in this year, Afghanistan upgrades his performance while Sri Lanka degraded. So it is most difficult to say that which team will be the winner. Afghanistan has more chance to win. Rahmat Shah played an amazing inning of 72 runs. M Shahzad 34, I Janet 45, H Shahidi 37, M Nabi 15, N Zadran 12, and Rashid Khan 13, also played well and reached Afghanistan's total score to 249/10 in 50 overs. Thisara Perera got maximum 5 wickets for Sri Lanka in 9 overs. Akila Dhanjay 2 and rest 3 bowlers got the 1-1 wicket but couldn't stop Afghanistan to build a big total 249/10 in this Afg vs SL 3rd match of Asia Cup 2018. Sri Lanka started the inning to chase 249 runs but all-out at 158/10 in 41.2 overs and lost the match by 91 runs. Upul Tharanga 36, Thisara Perera 28, D de Silva 23, A Mathews 17, tried to reach to the winning target but other players didn't support well. Four bowlers of Afghanistan Rahman, G Nabi, M Nabi, and Rashid Khan distributed 2-2 wickets between them. Two batsmen of Sri Lanka lost their wickets as run out. Afghanistan won this Afg vs SL 3rd match of Asia Cup 2018 by 91 runs. After losing this match Sri Lanka lost the chance to be live in this tournament because Sri Lanka had lost all two matches. You can watch live cricket score of all matches of Asia Cup 2018 at this website.